Theatre credits include Rumpelstiltskin Revisited for Goodger-Pink Productions, Grey Matter for The Magic Word Theatre, Titus Andronicus, Othello, The Queens and Richard III for The Shakespeare Company, Love(her)/Fight(her) for Urban Curvz, King Lear for Theatre Prospero, Without You, Major Barbara, and Roberto Zucko for Studio Theatre, As You Like It for Free Will Shakespeare Festival, Blood Wedding and A Midsummer Night’s Dream for U of A, and Two Gentlemen Of Verona and Romeo and Juliet for Shakespeare In The Park. Samantha has a diploma from the theater program at Mount Royal College as well as a BFA degree in acting from the University of Alberta. On a personal note, Samantha would like to thank her family, friends and the community for their overwhelming support on this endeavor, with a special shout out to Holleay, Meredith, Mike and her incredible mum for making this idea an exciting reality. A fun fact, Goodger-Pink was the maiden name of Samantha's grandmother, who was a theatre actress in England many years ago. “The theater is the only institution in the world which has been dying for four thousand years and has never succumbed. 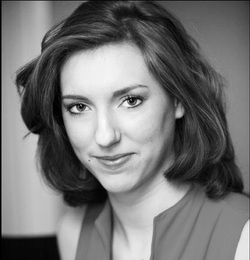 Originally from Edmonton, Holleay is a graduate of the University of Alberta's BFA- Acting Program. Since settling in Calgary, Holleay has appeared in iROBOT (Swallow-A-Bicycle Theatre), THE UNDERPANTS (Theatre BSMT), RUMPELSTILTSKIN, SNOW WHITE & ROBIN HOOD (Goodger-Pink Productions), LOST (Evergreen Theatre), Rosaline in LOVE’S LABOUR’S LOST (TSC), The Fairy Godmother in Rodger's and Hammerstein's CINDERELLA (UofC Operetta Company), and Elizabeth Stride in WHITE CHAPEL (Storybook Theatre). When not performing Holleay takes great joy and inspiration from teaching and working with children through Evergreen Theatre, Quest Theatre and CYPT. Holleay is thrilled to support her friend Sam's dream of bringing the joy of theatre to her childhood community of Okotoks and can't wait to expand that dream to more communities across Alberta.